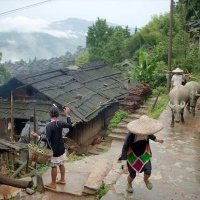 Basha Miao Village is located on the mountain lap (at an elevation of 550 meters) and surrounded by mountains. 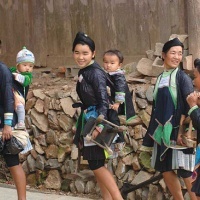 It is home to more than 300 Miao households and filled with legged wooden houses. The village is so remote and primitive that the villagers still keep very old lifestyle. The costume of Basha villagers has very strong flavor of the Qin Dynasty (221 B.C. - 206 B.C.). All the Basha men have very unique hairstyles, like the men in the Qing Dynasty they wear their long hair in braids. They attach great importance to their hair bun, which they believe is a symbol of masculinity, as well as an emblem of power. This is a hairstyle that's existed for thousands of years. The men in the village usually wear blue home-made clothes, take guns and carry a knife on their waists. The women often wear batik garment and silver accessories. The ancestors of the Basha Miao people were frontline troops who charged through forests and fought the bears there - all to guard the land where they lived. For hundreds of years, they have been guarding their village. Still today the men in Basha keep their musketeer heritage, which makes Basha the only tribe that can legally carry real guns in China. A strong sense of precaution inherited from their ancestors keeps this village isolated from the outside world. The villagers lead a self-sufficient life in the hilly areas and retain the dressing and living customs hundreds of years ago. 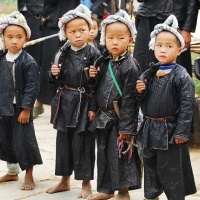 In Basha Village, young boys have to attend a shaving ceremony between the ages of seven and fifteen. The chieftain wets a sickle with the water used to boil eggs, and shaves off all of the boy's hair except for the central part, which is coiled into a bun. The blade caresses the scalp, and patches of hair fall to the ground. This shave is done without any shaving cream, or even a rinse. Boys get their first haircuts as a rite of passage, and then are given a hunting rifle at the age of 15 as a sign that they've become adults. The villagers in Basha worship trees, especially maples, as gods. They believe the buns on their heads represent trees, while the purple clothes they wear represent bark. (The color is a special bluish purple. Biasha people usually add egg whites into the indigo when dying the coarse cloth, making it shiny and waterproof.) In Basha, a tree is planted whenever a baby is born. Often it will be cut down to make the coffin when the person eventually dies. Cutting down ancient trees is forbidden in the village. The Basha people are hospitable. 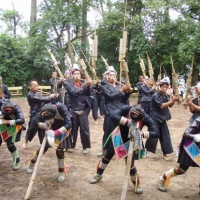 When visit the village, the martial men will greet their guests at the village gate by playing Lushen (reed-pipe wind instrument) and Mangtong (a kind of pipe instrument). At this time, the girls will block the gate and serve the guests with a cup of rice wine. After the wine serving and music playing, the men will make three shots to the sky with their gun and then open the village gate. Following the path flanked with trees, the guests are ushered in a big hall to see the Miao ethnic music and dance performances. 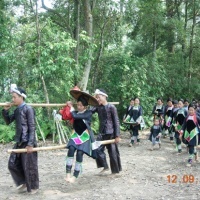 Basha Village has their own unique festivals such as Eating New Food Festival, Lushen Festival, and Ghost Festival etc. During the festivals, Basha people will play on a swing, hold water buffalos fighting, and run after the pigs. For more details about the village and its people, please trip with us. The village is incorporated in the below package, which is well designed by our travel specialists. If you are interesed in it, they can customize the itinerary according to your requirements. Hello, my family and I are planning to drive to this area. Are there any accomodations within Basha? Thanks! Dear natalie pestune, our travel specialist had replied you via email, please check it. Thanks for your questinons. hello! thank you for an interesting basha miao village information. 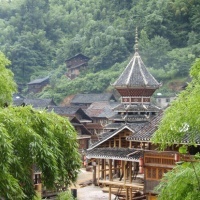 I am planning to go to Guizhou in two month or so. I am a photographer and plan to shoot Miao tribes. I would love to stay at the village for a week or two, so I can deep in the culture and daily life. Can you give me some hints on my trip. is it save to be there alone for that long time? I can speak Mandarin Chinese, I am studying in Hangzhou, but originally from East Europe. thank you. Yes Sing Sai Lo, this traditional village was once the filming location of the movie Lala's Gun in 2007. I like the movie very much, the story of the boy touches me. Is this the village where the movie Lala's Gun being shot at? Hi Billie, thank you for taking time to make a comment on our website. One of our travel consultants had sent you an email for the travel tips, please check your email-box. Merry Xmas. I was thinking of travelling to this kind of place in china. The more cultural, secluded kind of place. How do i go about organising such a trip? Am i allowed to walk into a village without them knowing of my arrival? any tips for such an expidition?